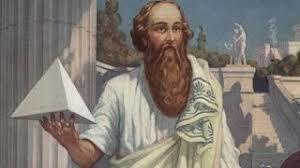 Pythagoras is a philosopher, mathematician and religious reformer of ancient Greece probably born in 580 BC. AD on an island in the Aegean, and died in 495 BC. Mostly known for the theorem that bears his name, he would have focused most of his work on the question of the existence of a law of numbers in all things, and of a mathematical proportionality in sciences as diverse as astronomy, medicine, music, spirituality.